the college, junior and semi-professional levels . by USAH and participating Leagues. 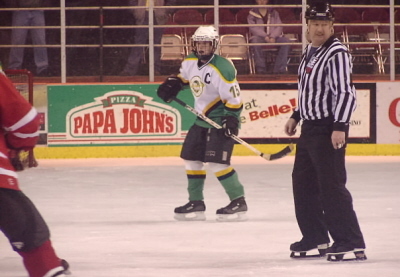 For two seasons this one was worn by Sioux City official Chad Stewart and is his first officials jersey. patch on the right. Attached ProAlt nameplate. 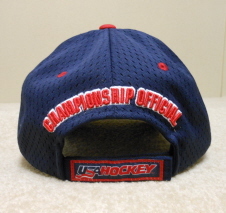 Manufacturer tagging in collar and embroidered CCM on hem. Size 50. Blue J's 2-0. 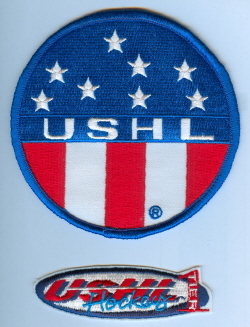 14-15 USAH crest on front and Championship patch on left shoulder. Made by CCM. Size 48.
patch added at the start of the 99 season. 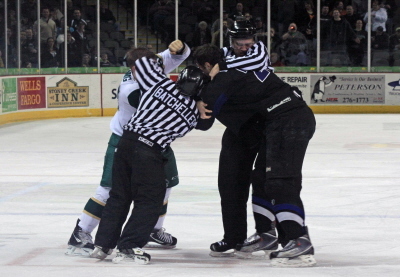 Both were worn for several seasons by all upper level Sioux City officials. 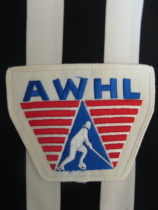 Official's Wearhouse patch. ProAlt attached nameplate. Manufacturer tagging in collar and embroidered CCM on hem. Size 48. Worn for several seasons. 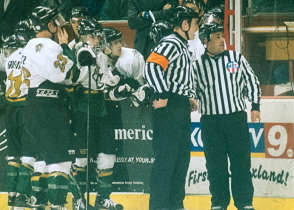 Replaced in 2004-05 season. Flag worn by all SC officials added in 2001. 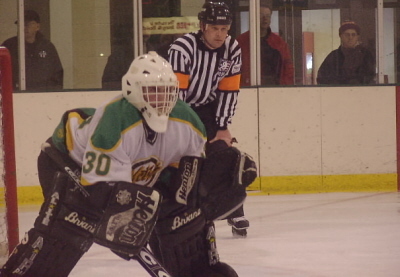 2001-02 first season with new style jerseys. tagging in collar and on right hem. Made by CCM. Size 52.
and manufacturer tagging above attached nameplate. Manufactured by Jofa. and manufacturer tagging above attached nameplate. 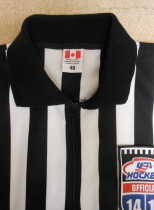 Sewn-in referee bands. Manufactured by Jofa. 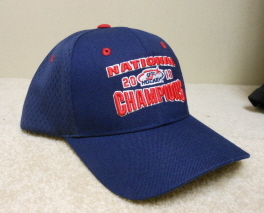 This style, while worn for many seasons has a new patch configuration starting the 2010-11 season. New T.J. Memorial patch was added to thew right sleeve. The Yellow ribbon in the left sleeve. 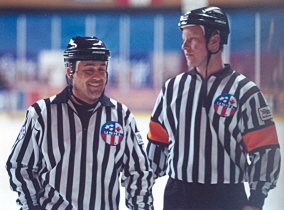 The USA Hockey Patch was worn only on linesman jerseys. Manufacturer tagging in collar and on back neckline. Attached US Flag and nameplate. Made by Jofa. Size 46.
also in collar. Embroidered number in place of zipper. Made by CCM. Size 48. 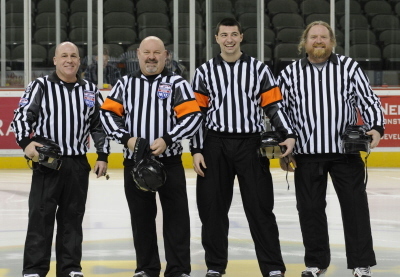 Presented to USA Hockey on-ice officials working the National Tournament. 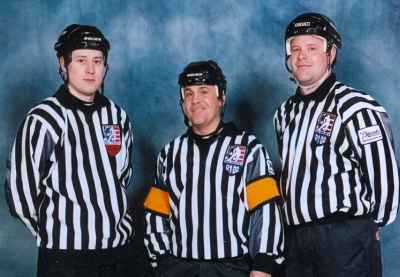 Current style worn by USHL officials starting in 2002. Large crest on left chest and nameplate and oval USHL logo on back. Sewn-on CCM logo on back hem. jerseys. 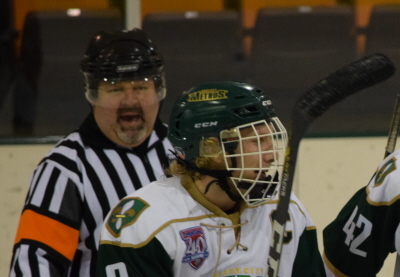 Musketeers loose in OT to the Chicago Steel 3-2. Hit in eye, twice on one shot!!! May think about a visor. 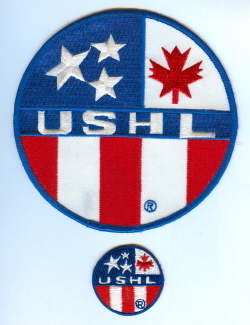 Rubberized/screened USHL crest & non-dated ribbon and attached nameplate. Made by AK Sports. Various USHL & USA Hockey buttons and enamel pins. 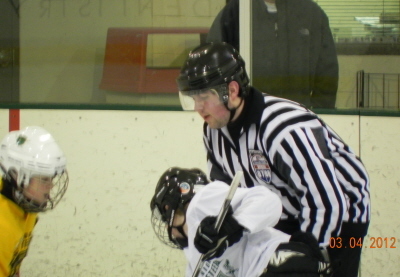 Didnt play high school hockey officiated instead first game was and eighth grader. SYHA for five seasons. 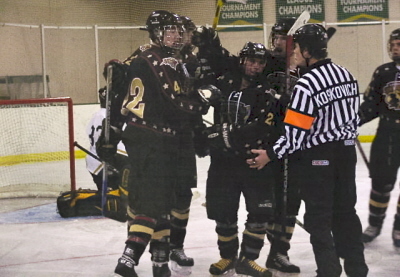 seasons (1987-90) and was an IHSHL State Championship runner-up two of those three seasons. James Page is always a good source of information and always had the numbers when I needed them. football at Morningside College where he became a stand-out All Conference GPAC Player. 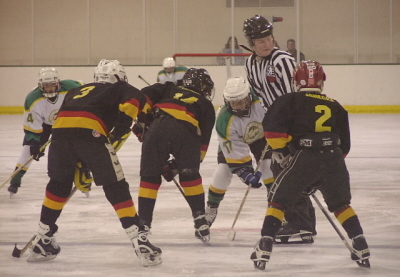 February 23rd a 5-4 overtime victory over the Ames Lil' Cyclones. the other hand...I'm not so sure about Landon. 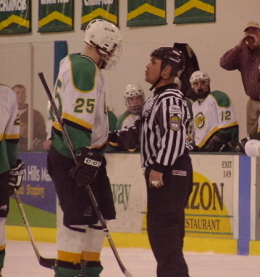 USHL & D1 levels and Chad was a long time USAH hockey official and a five season USHL linesman. four seasons. Note to self: Never tell Stewy he's to old to do something!!! 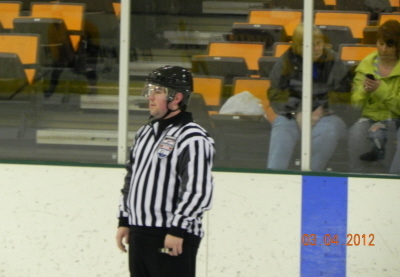 official for 18 seasons and worked a USHL/NAHL/SPHL schedule for nine seasons. 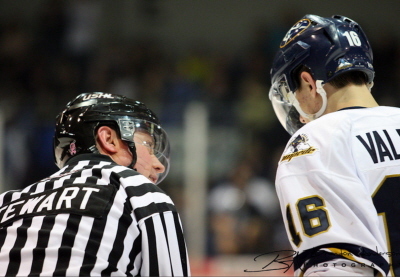 begin his quest to work at the USHL level. 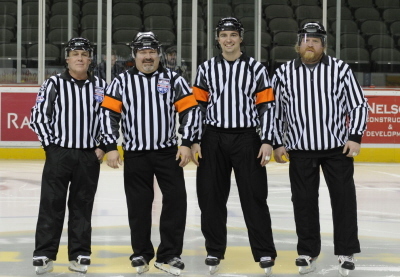 the lines in the MHSHL championship game. that saw the visitors from St. Louis defeated the Lancers by a pair of goals in the first game and a single goal in the remaining two. 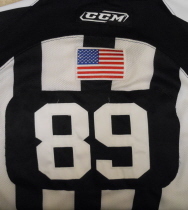 America West Hockey League referee jersey worn by Travis Smith. Crest on front. Sewn-in orange bands. Attached nameplate. Tagging in collar and embroidered on hem. Made by CCM. Size 50. 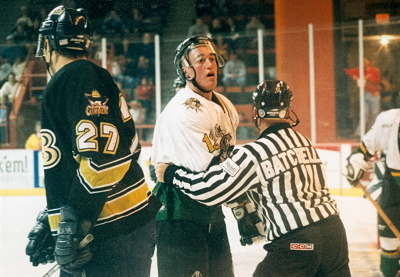 Travis spent three plus seasons as a USHL official, beginning during the 1998-99 season. 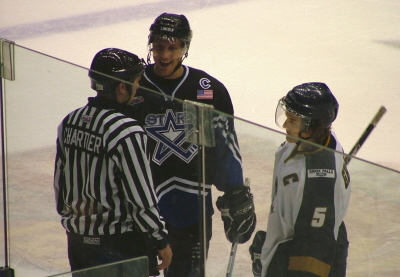 He would capoff his USHL career with a 2002 All-Star/Prospect game selections and as a Clark Cup Finals referee. patch on right front. 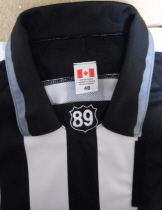 Manufacturer tagging in collar and embroidered on hem. Made by SP. 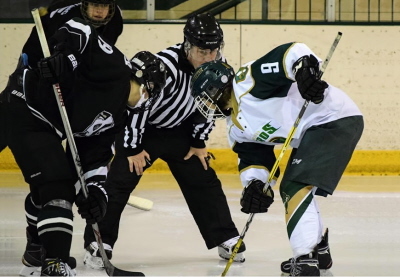 game and the Clark Cup Finals. 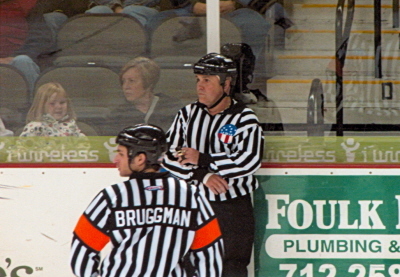 During his second season he would work the final game in the Sioux City Auditorium. patch on left sleeve. 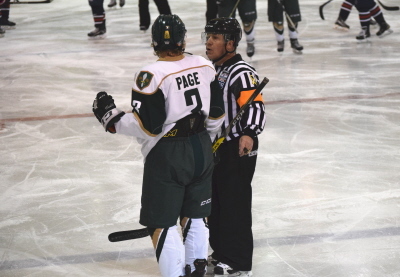 Small USHL logo above nameplate. Embroidered CCM on hem. 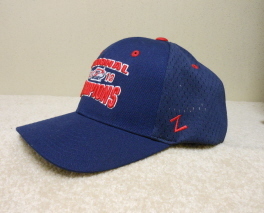 Worn during the 03-04 season. New oval shaped Tier 1 patch above attached nameplate. 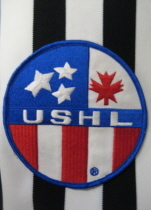 USHL 25th Season Anniversary patch on left sleeve. Embroidered tag on hem. Made by CCM. 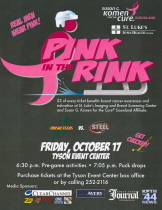 2006-07 Breast Cancer Awareness Auction. Ribbon is dated 2006-07. This was the first season for these tribute jerseys. Rubberized/screened USHL crest and ribbon and attached nameplate. Note Date in ribbon. Made by AK Sports. 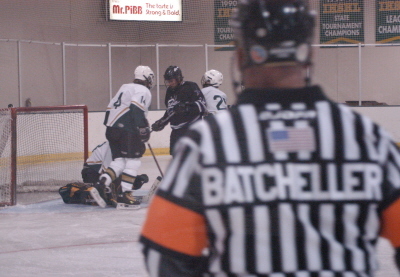 above the officials nameplate. 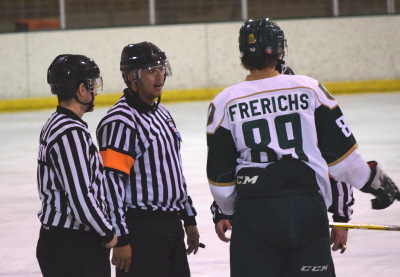 worn above the officials nameplate. right jersey sleeve around the 98-02 seasons right sleeve for the 2003-04 season for several seasons starting in 1999-2000. It was worn on the left sleeve. 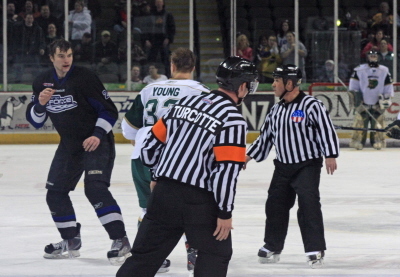 SIOUX CITY, IA — Past SYHA player and official Paul Koskovich has received his first professional game assignment. 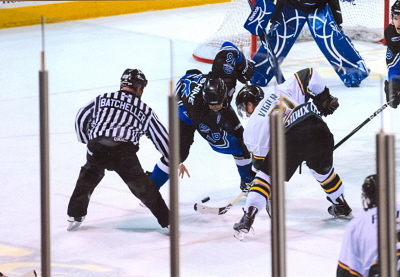 On February 1st, Paul will be working the lines in Richmond, Virginia as the Richmond Renegades face-off against the Jacksonville (Florida) Barracudas in a Southern Professional Hockey League (SPHL) match-up. 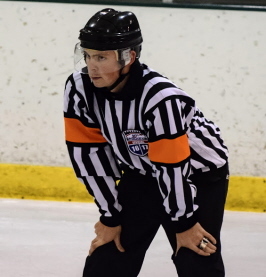 That following Saturday night he will be Officiating a Metropolitan Junior Hockey League (Junior A) game in Arlington, Virginia as the Washington Junior Capitols take on the Philadelphia Junior Flyers. 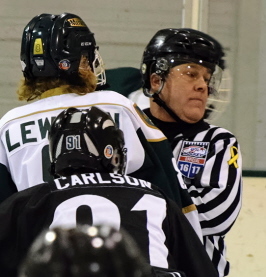 On Sunday afternoon he will again be wearing the bands in another MJHL game as the same Philadelphia team faces off against the Valley Forge Minutemen. Paul’s January and February schedule is and has been filled with stops in Des Moines & Waterloo Iowa., and Lincoln, Nebraska (USHL-Teir 1) Ames, IA (NCAA D1) Detroit, Michigan and St Louis, Missouri (NAHL-Junior A, CSHL & ACHL-Junior B, NCAA D1) and the above mentioned locations. 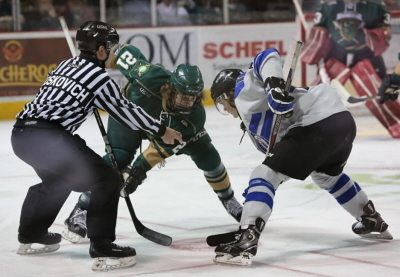 He will finish out his busy February with weekend stops in Lincoln and the Stars take on the Sioux Falls Stampede and on Saturday in Sioux City where the Musketeers will face off against the Stampede. 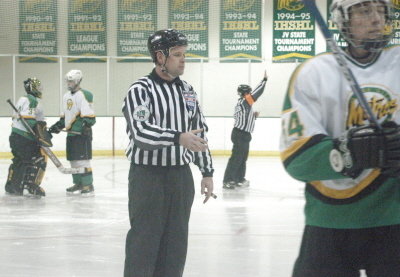 Paul spent 12 seasons as a SYHA & Metros Player and eight seasons as a USAH Official. 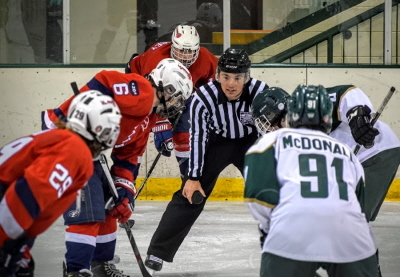 He is in his third full season as a USA Hockey ODP member where he sees the bulk of his games at the Junior A (NAHL) and Tier 1 (USHL) levels. He is currently based out of Lincoln, where is also a full time student at the University of Nebraska. 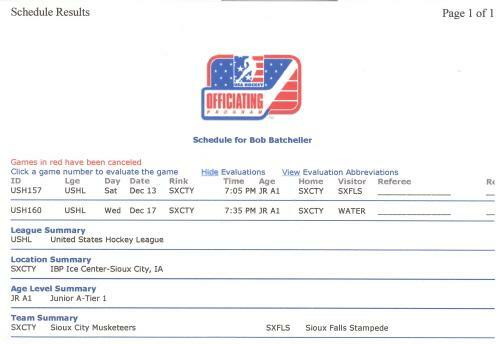 SIOUX CITY, IA — Several past SYHA players and current Sioux City officials have received post season game assignments. 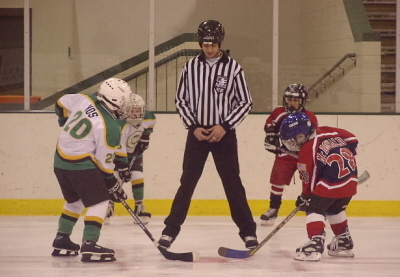 These game assignments are the result of outstanding officiating for the 2008 season and are assigned directly by USA Hockey Evaluators, Instructors and Supervisors. 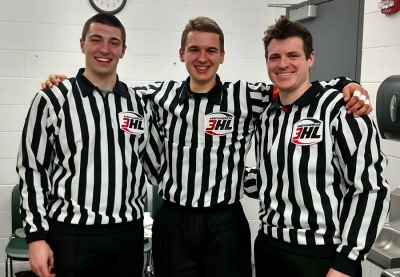 Paul Koskovich (right) was selected to work the MHSHL Varsity Championship Tournament in the Quad Cities. 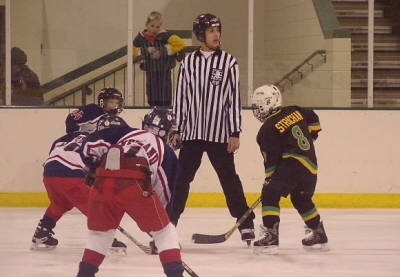 In addition to his qualifying games, he was designated as head referee in the Championship game. He was a past member of SYHA and a Metros player. 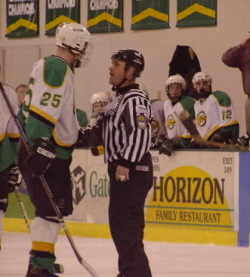 He is currently a member of the USA Hockey Junior Officiating Program staff. 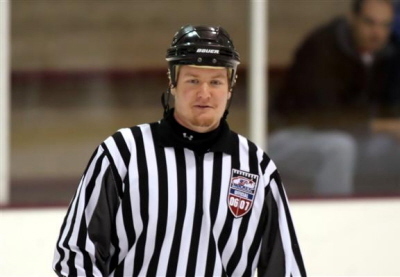 Eric Rapp was selected to work both the South Dakota High School Hockey Varsity and JV State Tournaments this year played in Mitchell and Rapid City, SD. 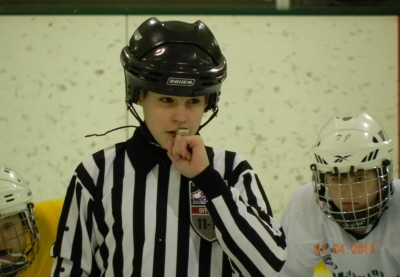 He worked several qualifying games and, in addition, was designated as head referee in the JV Championship game. 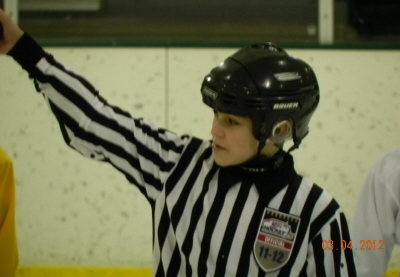 He is a past SYHA player and is currently an official in both MHSHL and SDHSHL leagues. 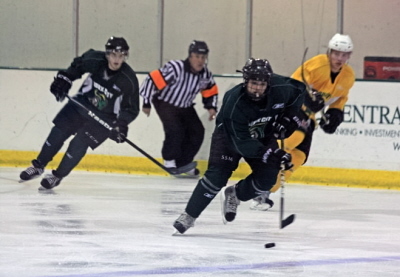 Brett Swanson was selected to work the MHSHL JV Year-End Tournament held in Ames Iowa. 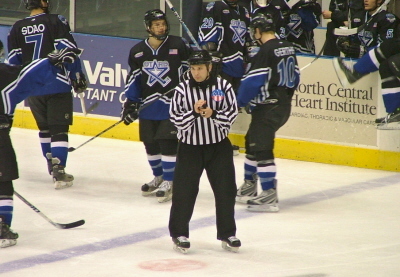 In addition several tournament qualifying games, he was assigned to work the lines in the All Star Game and the Championship game. 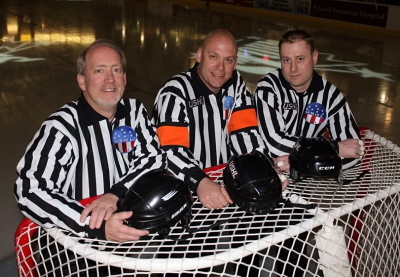 Rick Chartier and Bob Batcheller were selected to work the USA Hockey Central District Tier 2 Championship Tournament in Omaha, NE. This district tournament will include regional play in the Peewee, Bantam and U16 & U18 Midgets. In addition to Friday and Saturday qualifying games, Rick and Bob were also assigned to work final round games on Sunday as some of the weekend’s top officials. 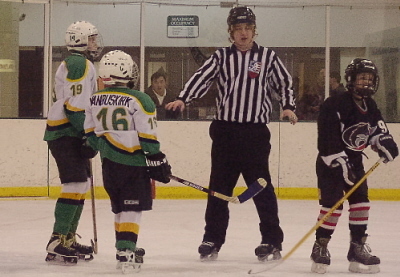 Rick worked the lines in the final Bantam Championship game and Bob refereed the U18 Midget Championship game. Both are past members of SYHA and Metro players for 4 seasons. 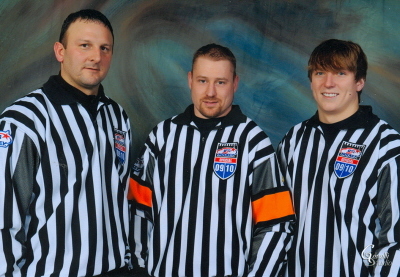 They are currently MHSHL officials and members of the USA Hockey Junior Officiating Program staff.